Posted by Luke Bouman on Friday, December 27th, 2013 at 11:12am. 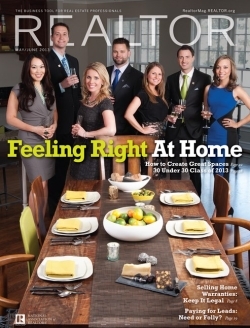 As an honoree Mr. Bouman will be featured in the May/June issue of REALTOR® Magazine. "It was quite an honor," said Bouman of the news, "I've known since I was 19 that real estate was my future career and this recognition further supports my belief that success in this business is determined by the individual, not by the market." Luke is a graduate of Calvin Collegeand the Holloways Real Estate Institute and has earned several real state designations including Certified Residential Specialist (CRS), Certified Negotiation Specialist (CNS) and Resort & Second-Home Property Specialist (RSPS). His success is not without a clear plan and vision of how to achieve his goals. "My mission is to redefine real estate representation with superior communication, careful listening, and thoughtful planning while utilizing the Internet and the latest technology, with a focus on the goals and needs of clients and providing exceptional service that aligns my values both ethically and spiritually," he says. Entrepreneurial experts in real estate, honorees are often sought after for speaking engagements, membership in various associations, career advice and certainly recruited by other real estate brokers. The News of Luke Bouman being named to Realtor Magazines 30 Under 30 list has hit Times Square in New York. This picture was taken of the Billboard where his information was shared. You can feel comfortable working with the Luke Bouman team, give us a call today! Here is the information that made it in the National Realtor Magazine: Luke Bouman, CRS, generally keeps his workweek to 45 hours, and avoids working Sundays at all. Such balance is possible, he says, because of his productivity-boosting systems that include multiple lead generation sources: his personal Web site, social media, Craigslist, and call-capture marketing. Bouman, 29, has optimized his Web site so it appears at the top of many searches. Bouman is also delegating more tasks since promoting his part-time administrative assistant to full-time. “I was nervous about relinquishing control, but it has turned out to be one of the best business decisions I’ve made.” Employing such growth strategies, Bouman increased his production by 40 percent in a year.